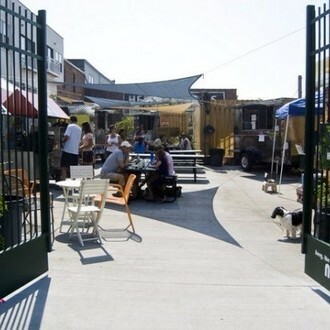 Infrastructure for a food truck courtyard could enable a variety of food to be served in the area with ability to move structures easily if flooding occurred. Perhaps this would have to be adjacent to the park, depending on the development guidelines. The $2,000 plus in fees to park a food truck on public property downtown would have to be reevaluated. A vendor court would go good with the concept of gaming/recreation areas.